What Are The Potential Impacts From An Open Pit Mine In Idaho's West Central Mountains? The Yellow Pine pit blocks natural passage of the East Fork of the South Fork of the Salmon River, a barrier to Chinook reaching their historic spawning grounds. It's also a source of heavy metal leaching into the river. Wanna Know Idaho traveled to Idaho's West Central Mountains to answer this question from McCall resident Fred Coriell: "What impacts will an open-pit mining operation, like the one proposed by Midas Gold, have on our region?" Cascade-based reporter Monica Gokey has the story for this episode of the podcast. I follow Coriell to the banks of the Salmon River outside Riggins, where he’s setting up a fishing rod for his son, Frederick. What are the mine’s potential impacts, Coriell wonders, on a beautiful scene like this? He tells us his concerns are two-fold — he worries about the boom-bust cycle of the mining industry, and about the environmental consequences of a mine. Fred Coriell is a resident of McCall, Idaho, and he wants to know what kind of impacts an open-pit mine like the one proposed by Midas Gold will have on local communities. "And I'm thinking generations ... I'm thinking of my grandchildren and great grandchildren," he says. The Stibnite mine has been dormant for nearly 20 years, but a new company, Midas Gold, sees Stibnite as economically attractive again. Midas Gold is currently in the permitting process to open a new mine at Stibnite, and the new plans are bigger than ever before. To help address some of Fred's concerns about employment, let's start by talking to someone who moved here for a mining job. In Donnelly, Idaho, I walk to to Sam Field's house in the rain. A dog barks, and he greets me warmly at the door. Field is 30. He’s one of the supervising geologists at the Stibnite mine. He moved to west-central Idaho for his job with Midas Gold, and he's built a life here — this is where he met his wife and had his daughter. Like a lot of people in the area, Field is an outdoorsy guy. 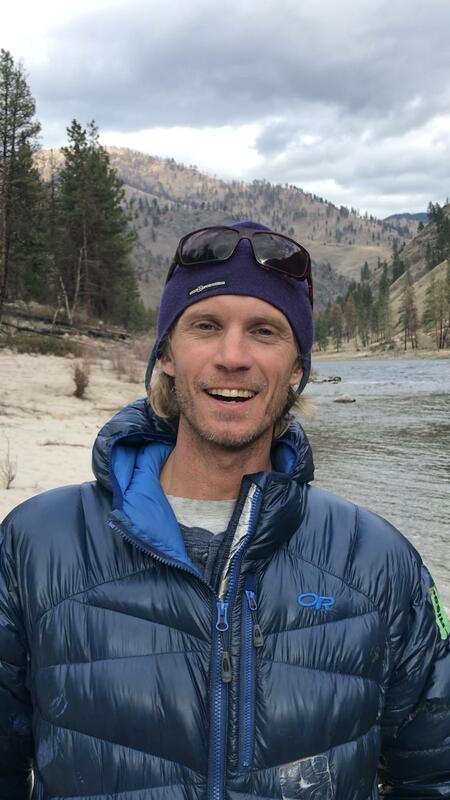 He enjoys snowboarding, fishing and dirt-biking. For him, working for Midas Gold is a very good job. "We feel very fortunate, you know. We love being here, we love the community, we have some great friends ... great schools." I ask Field if he’s heard the the kind of concerns shared by Fred, and if he’s ever been on the receiving end of backlash over the Midas Gold project. 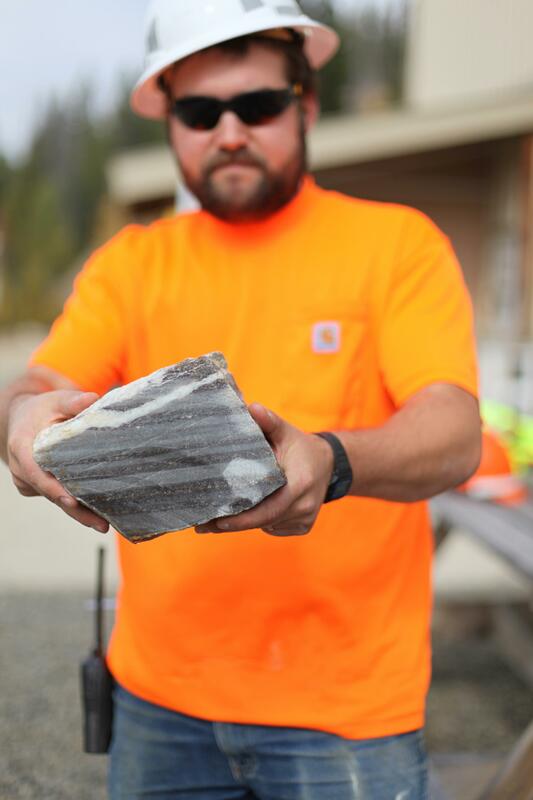 Sam Field, site supervising geologist for Midas Gold, holds up a piece of ore at the mine site. Field is one of several mine employees who's moved to the area for a mining job. "I have, yeah. I’ve had people have kind of a negative, you know, you can tell they have a negative opinion about it. A bias against the project and the people who work for it." Field’s job makes him a living example of positive economic benefit. But Casey Mitchell of the Nez Perce Tribal Executive Committee says there’s more to the story. After a town hall meeting in McCall on Stibnite, he sums up his beef with the project in one word. It sounds like "NAHT-zoh." And it's the Nez Perce word for salmon. "You know the salmon are held at a high level of honor and respect for the tribe," Mitchell explains after the second town hall hearing on Stibnite in McCall. "You know we see the importance of the salmon, not only to our people and our way of life, but to the land itself. They are a keystone species that needs to come back every year in order to replenish this land." The Salmon River has been damaged by the long legacy of mining here. Emmit Taylor is another Nez Perce tribal member and the director of the tribe’s fisheries watershed division. He said the Chinook running on the East Fork of the South Fork of the Salmon River was once on the brink of extinction. "And it’s through the efforts of the tribe and a lot of the partners that we work with that we are able to bring those fish back to numbers where there could actually be harvest," Taylor says. His tribe’s fisheries division is largely funded by mitigation payments from Bonneville Power, which operates hyrdopower dams on the Columbia River. The Nez Perce spend $2.5 million annually on the Salmon River fishery. And that’s not counting the cultural value of that resource. "We’ve never seen a mine that’s compatible with the natural resources of water quality," Taylor says. "And that’s just a risk the tribe is unwilling to take." The Nez Peace tribe has taken a public stance against the mine. "What we do support is restoration of the site as it is right now," he adds. 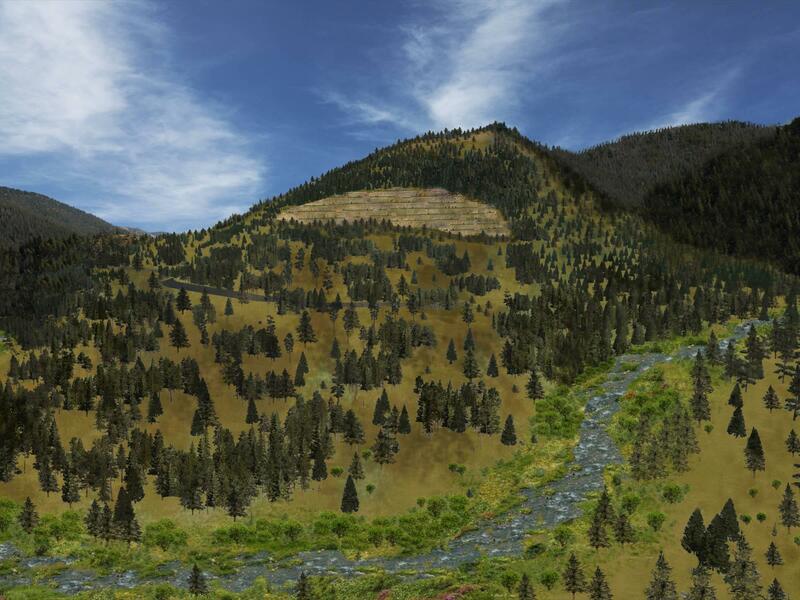 Pictured is a rendition of the Yellow Pine pit, restored in line with Midas Gold's plans. The company plans to backfill the pit seven years into the project. Critics point out that there's no legal definition for "restoration," and that any promises Midas makes to restore the site are entirely subjective. Midas geologist Sam Field says he's in the same boat. He also doesn’t want anything negative to happen to the environment. "This water and everything else is in my backyard, too," Field says. "And I don't want to see anything negative happen with the environment, but there's currently negative things happening to the environment just with the state the place is in." Clean up of the site has been off and on. To date, $7 million to $10 million has been spent to try to restore the site, but Stibnite regularly exceeds allowable limits of arsenic and antimony leaching. There’s a long way to go. On the banks of the Salmon River, our Wanna Know Idaho guy Fred and his two kids are still trying to hook a fish. Water laps at the shore, and Fred's two kids take turns between wielding the fishing pole and building sand castles on shore. Outdoor tourism is Idaho’s third-largest economy. That’s a much bigger portion of the state’s GDP than mining. Both are distinctly Idaho, but the question remains: Can an old-school industry like mining co-exist with a new-school economy focused on the outdoors? What story should Wanna Know Idaho tell next? Submit your curiosity below. P.S. Thanks to Boise music project ‘Up is the Down is The’ for the awesome theme music. Check the project out on Spotify and Bandcamp. Correction: An earlier version of this story explained that Blowout Creek was formed when a tailings dam failed at Stibnite. The failed dam was built for water storage for mining purposes, not tailings. We regret the error.